Ignore the Mouse. Eat the artisanal cheese. 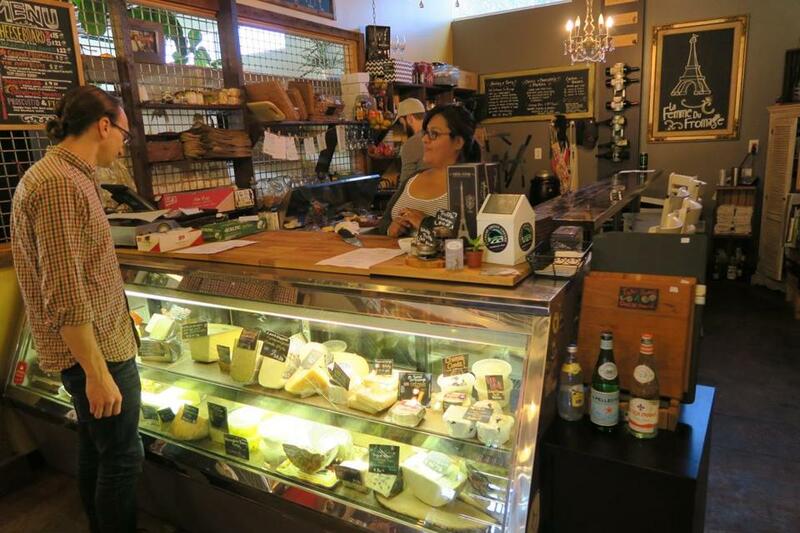 Cheeses at La Femme du Fromage. ORLANDO — Perhaps you wound up here as part of a family vacation. Sooner or later, everyone does. Home to more than a dozen theme parks — Universal Orlando, Walt Disney World — Orlando hosts more than 59 million visitors each year. Good news: You can now eat better in this central Florida city than at most tourist meccas. Celebrity chefs have flocked here, and at high-end destinations, you’ll find restaurants from Wolfgang Puck, Todd English, Emeril Lagasse, Masaharu Morimoto, and others. But, more interesting, a food renaissance is blooming at the local level, spurred by young chefs and entrepreneurs who appreciate and embrace regionally grown products, farms, and farmers. From Winter Park and its James Beard award-nominated chefs James and Julie Petrakis (the Ravenous Pig, Cask & Larder) to the rehabbed Baldwin Park neighborhood (the Osprey Tavern) to the burgeoning Mills 50 District (where established Vietnamese restaurants rub elbows with a wide variety of newly opened hot spots), Orlando is growing into a sophisticated food destination — perhaps even worth a visit for those who avoid all things Mickey. For an encapsulation of what’s happening, head to East End Market, a small and thriving neighborhood food hub in the Audubon Park District. It is to the Orlando area what Boston Public Market is to New England. On a sunny Sunday afternoon, the first thing I noticed as I approached the two-story building was a series of raised beds overflowing with lettuces, herbs, cucumbers, and flowers. Locally grown, indeed. Inside, the market hosts about a dozen merchants selling farm-fresh produce, meats, prepared meals, coffee, kombucha smoothies, and more. At the Olde Hearth Bread Company, an artisanal bakery with fragrant, crusty loaves, I connected with John Rife. A real estate developer, Rife is an unlikely champion of food entrepreneurs and local farmers. (“I grew up eating Kraft Singles. I did not grow up in the food industry,” he said.) But he is credited with founding the Winter Park Harvest Festival in 2010, cofounding the Winter Park Urban Farm (where one can learn farming techniques), and hosting farm-to-table events. Wanting to provide an indoor space for people to “be creative,” Rife opened East End Market in late 2013. “The market acts as an incubator for small businesses who may want to try their hand at retail without making a huge leap into full-time leases,” he said. Strolling through the central aisle, my attention was repeatedly distracted by visual and olfactory delights. Where to go first? At Local Roots Farm Store, 60 farms and small purveyors from Jacksonville to Miami have an outlet for their bounty of produce, meats, honey, beers and wines, olive oil, jams, and bath and body products. Nearby, Houndstooth Sauce Company offers samples of red and white barbecue sauces, as well as jars of marinades, dressings, glazes, dipping sauces, and rubs to take home. Hungry? Their selection of hot and cold sandwiches, soups, and salads can be enjoyed at outdoor picnic tables adjacent to the vegetable and flower garden. Though the cheeses at La Femme du Fromage were tempting, including Gjetost, a Norwegian cheese touted as “tasting like peanut butter,” my sweet tooth led me to Gideon’s Bakehouse, where swoon-worthy cookies, cakes, and pies are all crafted in small batches. What complements a pistachio dark-chocolate cookie? Why, fresh brewed coffee, of course. I found my perfect accompaniment at Lineage Coffee Roasting, where the friendly staff serve meticulously prepared espresso and filtered single-source coffees. At the far end of the market, a 760-square-foot kitchen is a permanent cooking space for East End Market’s tenants, as well as a legal space for entrepreneurs and small caterers to rent by the hour for cooking, processing, and storing their creations. A food incubator program teaches everything from licensing, insurance, and branding while offering an opportunity to get feedback. In addition, there is a bookstore (Bookmark It), a plant shop and florist (Porch Therapy), an organic juice and smoothie vendor (Skyebird), and a catering company (Cuisiniers), along with other indie food-related businesses. The market is also the headquarters for something called Fleet Farming — an organization that takes over residential yards and uses a fleet of bicycles and volunteers to get local products to chefs and to the farmers’ market. It is so popular there’s a waiting list to participate. East End Market, 3201 Corrine Drive, Orlando, 321-236-3316, www.eastendmkt.com.